MEMPHIS, TN--(Marketwire - October 4, 2007) - Methodist Le Bonheur Healthcare continues to be an innovator in the health care industry by being the first hospital in the Mid-South to launch a Virtual Welcome Center (VWC). The VWC is an innovative, web-based technology that gives patients and their families a visual tour of Methodist University Hospital. In addition, it provides people with the information they need to know before arriving to make their visit as easy and stress-free as possible. "Our goal in bringing the Virtual Welcome Center to life on our website is to make every patient and their family feel as comfortable and at home in our hospitals as we possibly can," said Jill Fazakerly, director of marketing for Methodist Healthcare. "Through the Virtual Welcome Center, we can provide unparalleled patient and physician education regarding hospital resources, the advanced medical treatments we provide and directional information for Methodist University Hospital including where to park, where to check in and a comprehensive layout of our facility." -- Video segments highlighting general patient information about Methodist University Hospital and videos specific to neuroscience services and treatments available at Methodist University Hospital Neuroscience Institute. - Welcome to Methodist University Hospital. The Virtual Welcome Center is an extension of Methodist's surgical webcasting program, which continues to be extremely successful. To date, there have been over 250,000 hits to Methodist webcasts and more than 131,000 people have watched a live or archived event. In addition, each Methodist webcast is featured on the National Library of Medicine website, where they are available for on-demand viewing. To access the Virtual Welcome Center, log on to www.methodisthealth.org and click on Visit Our Virtual Welcome Center on the left hand side. 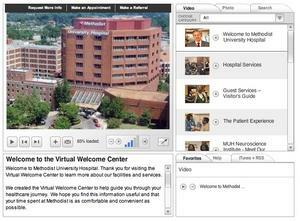 The virtual Welcome Center is produced by OR-Live.com, a trusted source for surgical video. 'Our goal in bringing the Virtual Welcome Center to life on our website is to make every patient and their family feel as comfortable and at home in our hospitals as we possibly can,' said Jill Fazakerly, director of marketing with Methodist Le Bonheur Healthcare.